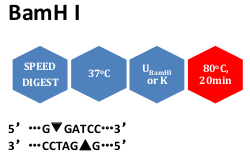 BamHI is a restriction enzyme purified from Bacillus amyloliquefaciens H.
Unit calculation assay conditions: 100 mM NaCl, 10 mM Tris-HCl (pH 7.9 @ 25°C), 5 mM MgCl2, 1 mM dithiothreitol, 100 μg/ml BSA. Incubate at 37oC. Absence of contaminants: 100 units of BamHI incubated for 16 hours at 37oC with 1 μg of λ DNA resulted in a DNA pattern free of detectable nuclease degradation as determined by agarose gel electrophoresis. After 50-fold overdigestion with BamHI, greater than 95% of the DNA fragments can be ligated and recut with this enzyme. Heat inactivation: 80oC for 20 minutes. Star activity: Conditions of low ionic strength, high enzyme concentration, glycerol concentration>5% or pH>8.0 may result in star activity. of BSA to a final concentration of 100 μg/ml.